Short term their prognosis is good but long term they suggest increased risk of death and cognitive decline. Lacunes involve small branches of the larger arteries < 0.4 mm in diameter and are usually end arteries with no collaterals. These are branches of arteries 4-8 mm in diameter which is a 10 fold drop in size/diameter. The gradual reduction in calibre is not seen so these small vessels are more vulnerable to elevated blood pressure. 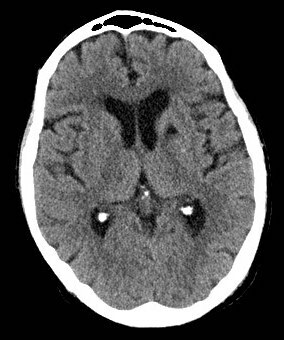 Lacunae, or small-vessel strokes, large overlap with small vessel disease but SVD is the pathology and lacunar strokes the effect. The ostia of the penetrating vessels may be occluded by a large thrombus within the lumen of the main vessel. The strokes in this case are usually larger than a single lacune and would not represent true penetrating artery disease. 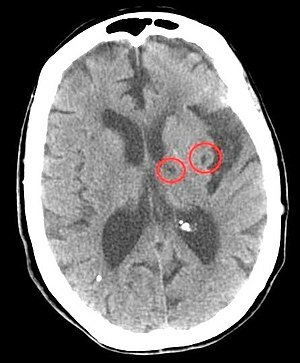 Basic pontis (pans) due to occlusion of a single small perforating artery supplying the subcortical areas of the brain. Lacunar strokes are typically subcortical involving white matter tracts and so classically no cognitive loss, aphasia or other higher functions affected. May at times be a staggered slow presentation. Pure Motor Stroke (PMS) Usually the commonest in clinical practice. Unilateral, pure motor deficit. Clearly involving two of three areas (face, arm and leg) With the whole of any limb being involved. Can be anywhere along the corticospinal tract including the posterior limb of the internal capsule or the basis pontis. Pure Sensory Stroke (PSS) Unilateral purely sensory symptoms ( +/- signs) Clearly involving two of three areas (face, arm, and leg) With the whole of any limb being involved. Lesion in the brainstem or thalamus (ventral) or thalamocortical projections classically. Ataxic Hemiparesis (AH) Ipsilateral cerebellar and corticospinal tract signs . With or without dysarthria . No higher cerebral dysfunction or a visual field defect. Lesion can be anterior limb of internal capsule or corona radiata. Others report posterior limb IC, thalamus, lentiform nucleus and cerebellum. Silent a great number of lacunes cause no symptoms at all and are only found incidentally on imaging. In fact silent are 5 times as common as non silent. Striatocapsular infarcts: embolic occlusion of the MCA often occludes penetrating branches and results in subcortical infarction which can resemble a lacunar but is usually larger and more crescentic in shape. Microbleeds : these form in the same areas. They can leave behind small cavities. My need Gradient echo and similar protocols to try and identify causality. Vascular spaces: may be seen in the subcortical areas. Not pathological. MRI:more sensitive especially for lesions in pons. Restricted diffusion and reduced ADC for acute lesions. For older lesions the question is are these ischaemic or haemorrhagic cavities. Gradient echo and similar protocols can help define these. Angiography: may suggest that small vessels occluded due to large vessel disease or occlusion e.g. a non occlusive thrombus in Basilar artery. Management of coexisting diabetes, lipids, smoking cessation. Consider antiplatelets, statins though the evidence base is not as strong as with other ischaemic stroke causes.